Update: On Feb. 26, Unbuntu announced that it's adding 20 more devices to the list of machines receiving the Ubuntu Touch developer preview. Among the handsets and tablets (viewable here) are the HTC One X, One XL, One X+, Sony Xperia S, Sony Xperia T, Samsung Galaxy S3 (international, AT&T and Verizon variants), Samsung Galaxy Note, Note II, Samsung Galaxy Tab 2 10.1 Wi-Fi and Motorola XOOM. As noted by SlashGear, the presence of older phones on the list is a testament to the OS's efficiency. 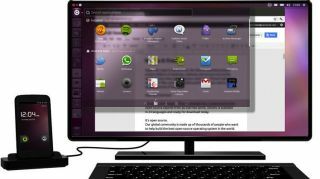 In January, Canonical teased a version of the Ubuntu software for Galaxy Nexus smartphones would be released sometime in February. The new operating system was announced just before CES, revealing Canonical's intent to bring the full range of desktop capabilities to compatible smartphones. Canonical has primarily used the Galaxy Nexus as its test device thus far, and it wasn't that shocking to learn a developer version of Ubuntu would be handed out so soon. However, the developer just revealed a version of Ubuntu for Nexus 4 would arrive with the Galaxy Nexus edition, which comes as a bit of a nice surprise. Set to arrive on Feb. 21, the touch developer preview of Ubuntu for both Nexus smartphones will provide images and open source code for more savvy users to mess around with while they wait for a completed version. The idea is to give Ubuntu enthusiasts and developers a chance to see what the OS has to offer, and give an early lead on potential app creation for the smartphone software. Canonical will also release tools to help users flash their existing devices to the developer preview, which would allow them to stay up to date with the most current version. Attendees of Mobile World Congress can bring their Galaxy Nexus and Nexus 4 smartphones to the Canonical booth, where the developer will flash the devices themselves. Additionally at MWC, Canonical will have a variety of Ubuntu devices on display (including a possible tablet), though the actual proprietary phones aren't expected to arrive until October. "Our platform supports a wide range of screen sizes and resolutions. Developers who have experience bringing up phone environments will find it relatively easy to port Ubuntu to current handsets," said Canonical's Pat McGowan in a statement. "We look forward to adding support for additional devices for everyday testing and experimentation." The group has also created downloadable app design guidelines, giving potential developers the power to create for the full range of Ubuntu platforms. Though iOS and Android have dominated the market thus far, there's plenty of room for a possible third option as Windows Phone 8 and BlackBerry 10 have yet to assert themselves in the marketplace. Whether that OS is Ubutnu will largely depend on how quickly and easily users are able to assimilate the open source software.